Google Alerts is an important tool for businesses and it’s free! Not only that but it’s very simple to use. Google Alerts will alert you of new content that has appeared on the web relevant to the keywords you have asked it to alert you about. 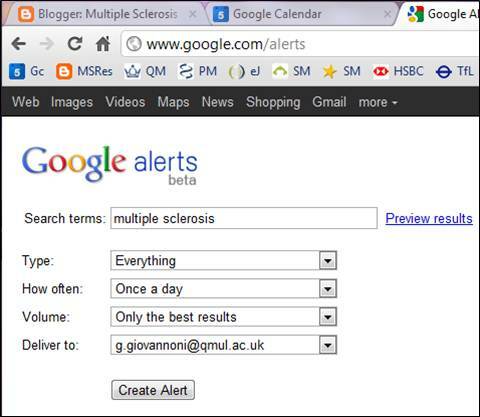 You can be alerted immediately, daily or weekly either to your email or RSS feed. See our simple tutorial for details. All you need is a Google account to use Google Alerts. Why is this useful and how does it relate to your business? Do you ever worry about what people are saying about you? This tool will ease your mind immediately, if you use Google Alerts regularly – you’ll be the first to know! This enables you to address any complaints AND compliments quickly. This will serve you well in projecting a good customer service image. Do you want to know what your competitors are up to? Are they doing anything new? Any new “fish in the sea”? This is what you need to use Google Alerts to find out. You also can keep up with new industry knowledge. How Do People Find People These Days? Before the internet and certainly if you are an adult, you will remember the days when every hard copy, paper telephone directory was dog eared, dirty, torn and well used. You would have it close to hand and retrieve it every moment that you needed to find a choice of products or services in your area or nationally. The Yellow pages was like Google when it was an ape before it evolved into a modern species. Each time the new updated telephone directory landed on your door mat, you would eagerly replace the old one with it. I’m sure many of you like me often don’t bother to take it out of the plastic wrapper any more. Am I right? Why is that? Well times have changed and now we have unintentionally changed how we find products and services. First of all, every telephone directory is online now. So rather than thumbing through the pages, we can type a keyword into a search bar and get what we need quickly. As part of our SEO service at MediaHeads, we enlist you into the directories because it has SEO benefits. However, even though the digital phone book is more appealing than the traditional hard-copy phone book, do people go to such websites to find you? The answer is not many people do, not directly. When a keyword or phrase is entered into a search bar of a search engine, often one or two of the results take you to a phone directory however what did the person do in the first place? That’s right, they used a search engine! When most people turn on their computer and start up their internet browser, what is their homepage usually? Google or Yahoo or perhaps another search engine. Masses of people are now using search engines on the internet to find businesses near them or nationally, particularly Google. So then, it is vital to your website success that you appear within the top 5 search results of your strategically chosen keywords. To achieve that is not always easy depending on the type of business you have and the kind of competitors you have. MediaHeads can help you to achieve this and we are always abreast of Google’s crawling behaviour. Contact us now for a free assessment of what your internet presence is and how we can help to improve it. Call us on 03333 44 77 55 or click here for more details. It’s more important today than it ever has been to get yourself an online presence. There are dozens of popular social media platforms to choose from, but from a business perspective, it’s vital that you’re set up and active on Twitter, Facebook, LinkedIn and Google +. Once you’ve got the basics set up, you should use other social media platforms to your advantage- YouTube is key for anyone who would really benefit from video marketing, such as if you’re selling a product that is marketed the best through a visual demonstration. Likewise, Instagram is an important tool for anyone who relies on visual aesthetics to sell a product. Other social media platforms include Tumblr, Vimeo (which is similar to YouTube), Pinterest, and Snapchat. Although it’s useful to have an online presence on as many social media platforms as possible, you may decide to hold off on adding these platforms to your marketing strategy until you’re comfortable enough with other platforms to begin with. So now you know where you need to be, but how do you really excel at making a name for yourself online? There’s no point having an account if you’re not going to make use of it. Posting regular updates keeps you relevant to your followers and ensures you’re not lost beneath the hundreds of other business accounts that are similar to yours (harsh truth). Try to make it a morning habit to make a post- it could be anything from talking about the weather outside, to announcing a competition, to reminding customers of your contact details. It really doesn’t matter if the topic isn’t relevant (to a certain extent), as long as your name is out there. There are also apps that you can use to schedule posts weeks, or even months in advance, so if you’re not great at keeping a routine, you don’t have any excuses. There’s no better way to stay in-the-know than to follow your closest competitors’ social media accounts. It’s not only a way to track how they’re doing sales-wise; you can also steal any social media marketing strategies of theirs that are working particularly well for them, as well as any design and layout tips. Look out for those who are doing particularly well followers-wise, as that’s a sign they’re doing something right. Every business has a target audience, and it’s no different when it comes to social media. Make sure you keep your audience appropriate to the services or products you’re selling, so they’ll be interested in your posts and keep updated with your account. There’s no better way to excite your current followers, and bring in a shedload of new followers, than by hosting a competition or a giveaway. The rules could be as simple as liking the post and tagging a friend, and you could offer one of your latest products/services as a prize (or a substantial discount on the product/service). You could give an extra chance to win if your followers share your post, in order to bring in more views and increase your follower count. Be patient- social media success doesn’t happen overnight! It’s unrealistic to expect to gain hundreds of followers immediately after setting up your account; social media is a work in progress. By consistently posting, engaging with followers, and promoting yourself on your website and other platforms, your following will slowly build, and you’ll start to see results. If you need any help setting up or running your social media accounts, the team at MediaHeads has extensive marketing experience and can help you with anything you may require. Give us a call on 03333 447755 or email us at enquiries@mediaheads.co.uk for more information. An exciting opportunity has arisen within MediaHeads to join the team. We’re looking for a sharp, motivated and versatile individual. We are digital marketing agency with almost ten years of experience in online marketing. Our aim is to deliver beginning-to-end marketing solutions to businesses to help them to achieve their marketing goals. We cover a range of services including website design and management, SEO, email marketing, etc. In this role you will report to and assist the Project Manager with the delivery of marketing activities for clients. You will be expected to fulfil the following roles and responsibilities. Send out press releases, update blogs etc. 4 GCSEs Graded C or above preferably in English, Maths and ICT. The right candidate may be offered a full-time job upon completion of the apprenticeship. Businesses across the whole of Staffordshire are advertising to over 21,000 vehicles every day on the Digital Billboard located outside M Club Spa and Fitness. If you would like to join these advertisers, contact one of our team today on 01782 450 111 or e-mail enquiries@mediaheads.co.uk.